I LOVE ribs! Even more, dipped in sweet and spicy BBQ sauce! Bill however, prefers to eat his dry, without sauce! I recently had a craving so I was inspired to prepare some for a wonderful Sunday dinner with Michelle & Jacob. Believe it or not, Jake’s 22 years old and had never tried them in his entire life! He didn’t know what he had been missing and after enjoying mine, he too is a fan! This is an easy and scrumptious dish, but keep in mind that you’ll want your pork spare ribs with a dry rub to sit at least 24 hours in the refrigerator in order to soak up all the wonderful flavors of the rub! The cooking of them is low and slow, so start them in the morning for an evening dinner! 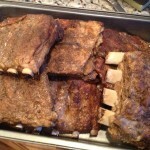 I cut the ribs down into three sections per full rack. 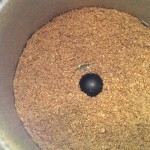 After mixing the dry rub it’s ready for use on pork spare ribs. 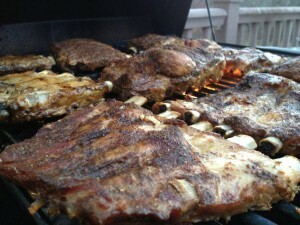 Apply the rub generously to one side of the ribs covering the entire rack and then rub it in with your hands. 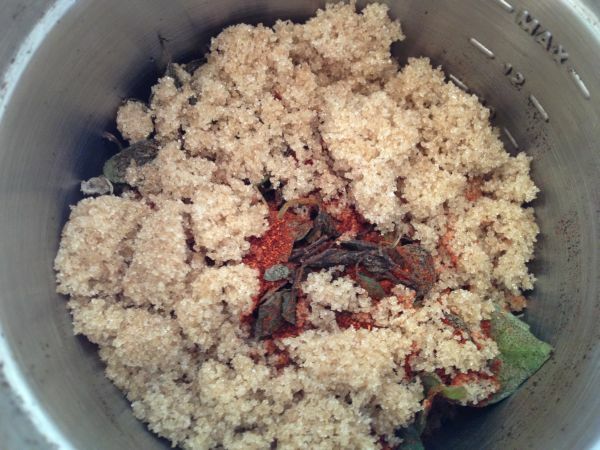 This will get a little bit messy but you want the rub to really soak into the meat. Flip the rack of ribs over and rub the rest into the other side of the rack ribs. I do this in my clean stainless steel sink for easy clean up! 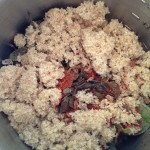 Place into zip lock bags and allow to marinate in the refrigerator over night for at least 24 hours. 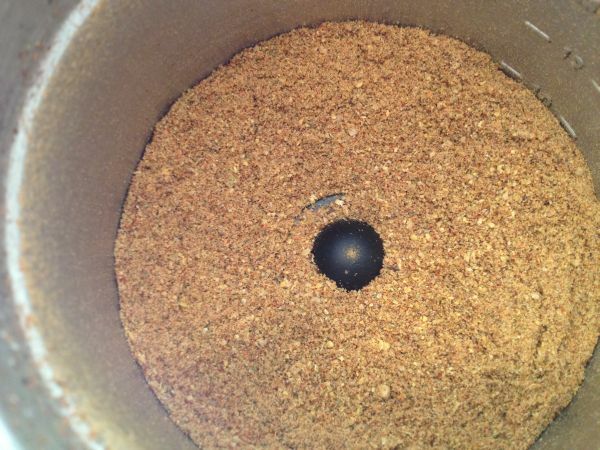 This allows the dry rub to penetrate the meat to its fullest. Like traditional Barbecue, pork ribs should be cooked low and slow. I once heard a pound an hour and that has been a good rule for me. 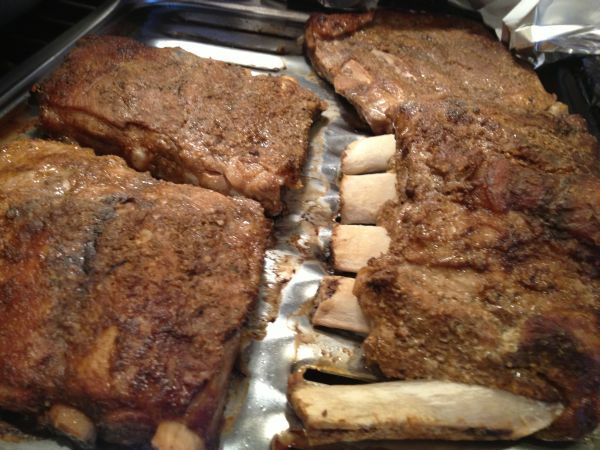 These cooked eight to nine hours and fell off the bone! 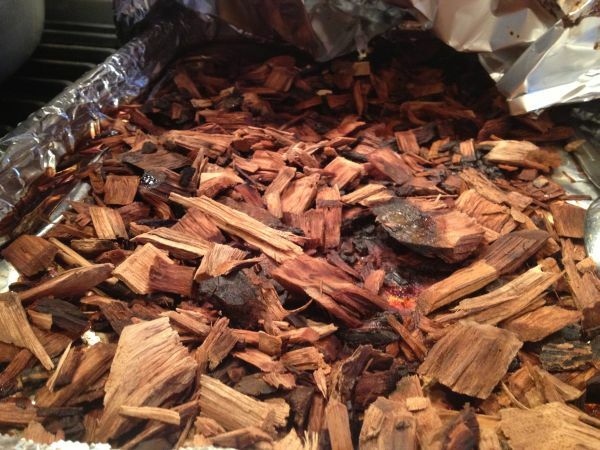 Place the wood chips in water (about an inch or so) on the bottom of a broiling pan that has been lined with foil for easier clean up. (the image of the chips is AFTER they cooked all day) Place ribs on top rack. 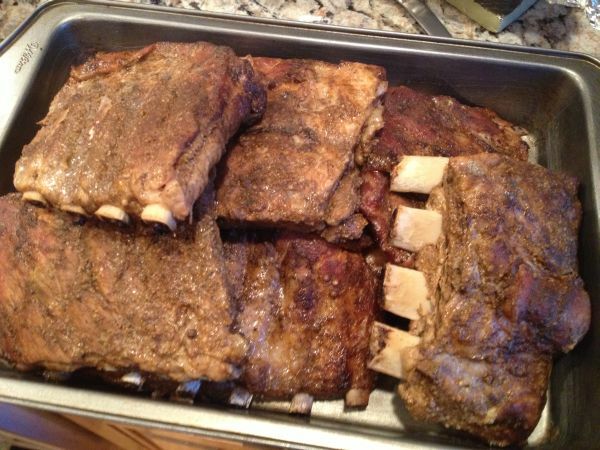 When you are ready to bake the ribs, place them on a broiling sheet covered with aluminum foil and bake into the oven at 250 degrees for many hours. 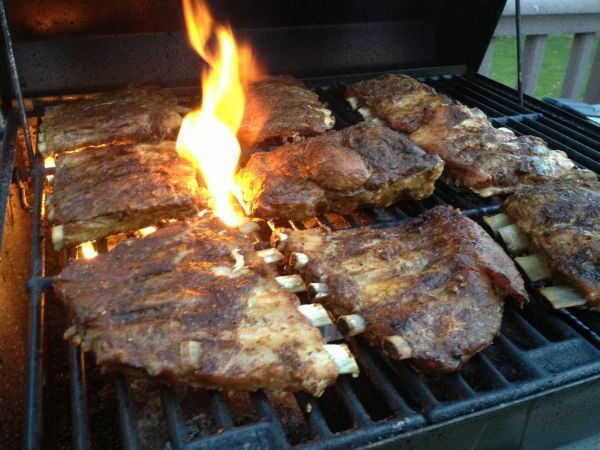 Ribs are done when they are tender enough to easily pull the meat from the bones and the internal temperature is at least 165 degrees. 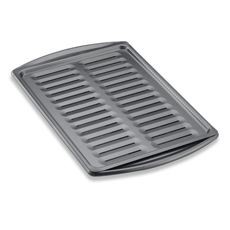 Once the meat is cooked and tender, remove them from the oven and transfer to the grill to char and caramelize them. Place the ribs on hot grill for 3-5 minutes per side to sear the meat and give them a grilled flavor. 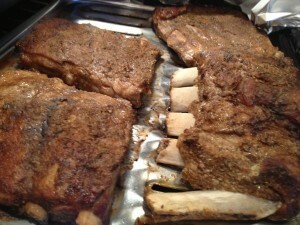 They are thick and juicy and for those who prefer “Dry” ribs, these will not be dry (meat) at all. 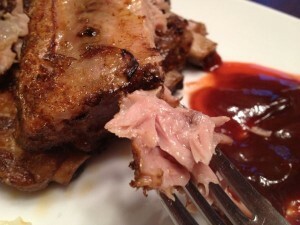 Those who like sauce can add it at the table and those who prefer the meaty flavor of these ribs can simply enjoy as is! 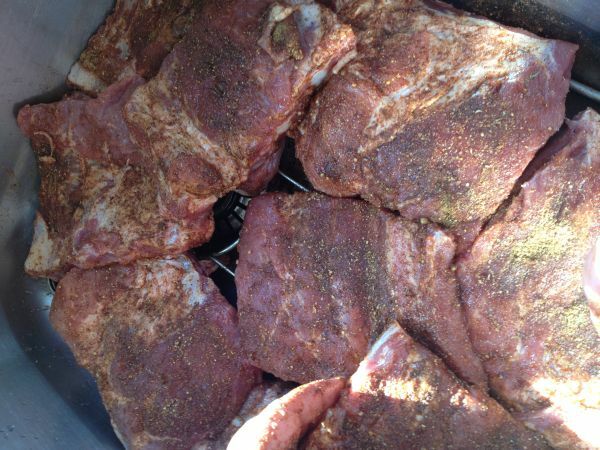 Allow ribs to rest 10 to 15 minutes. My favorite way to eat them is with my sauce on the side and to “dip” them! I take my favorite sweet barbeque sauce and shake a bit of “Franks” hot sauce in it. Finger lickin’ good!